Flight controllers managed to gain control of a commercial craft carrying a ton of supplies for the International Space Station after it ran into thruster trouble shortly after liftoff, but the earliest the Dragon capsule could show up is now Sunday, a full day late. The Dragon, owned and operated by SpaceX, holds considerable science experiments for the space station as well as food and spare parts. "We're definitely not going to rush it," said SpaceX's billionaire founder Elon Musk. "We want to make sure first and foremost that things are safe before proceeding." Musk said six hours into the flight that all four sets of thrusters finally were working. "All systems green," he reported via Twitter. The problem may have been caused by a stuck valve or a line blockage. The thrusters are small rockets used for maneuvering the capsule. An hour later, the Dragon was raised with the thrusters to a safe altitude. "Dragon back on track," he said in a tweet. It was the first serious trouble to strike a Dragon in orbit. None of the four previous unmanned flights had any thruster issues, Musk told reporters by phone from company headquarters in Hawthorne, California. He said it appeared to be a glitch versus a major concern. 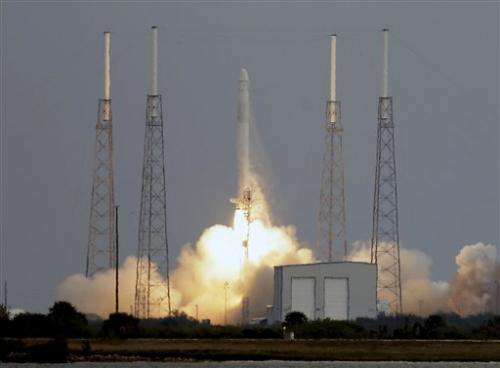 SpaceX has a $1.6 billion contract with NASA to make a dozen deliveries to restock the space station. This is the third trip by a Dragon capsule to the station; the first Dragon flight, in 2010, was a solo test. NASA space station program manager Mike Suffredini said at least three groups of thrusters on the Dragon need to work before the capsule can come close to the complex. That's a safety rule that will not be waived, Suffredini said. Engineers for both SpaceX and NASA plan an exhaustive study before allowing the rendezvous to take place. The Dragon could hang around at least a month before linking up with the station, Musk said. It's supposed to spend more than three weeks there, in large part to accommodate science samples that will be on the return trip. SpaceX is in charge of the flight until it gets near the space station. Then NASA calls the shots. "If we can convince ourselves the data's good, I suspect we can find an opportunity on Sunday, but again, we have to go look at it," Suffredini said. The fresh apples aboard Dragon—straight from the family orchard of a SpaceX employee—will be applesauce or worse the longer the delay. There's other fresh fruit as well for the six station astronauts. Musk acknowledged it was scary for a while. "Yes, absolutely, it was a little frightening there," said Musk, whose fortune came from co-creating PayPay. He stressed that the company's Falcon 9 rocket performed "really perfectly" and that the thruster problem was isolated to the Dragon. On the previous flight in October, one of nine first-stage engines on the Falcon rocket shut down too soon. A communication satellite hitching a ride was lost. SpaceX hopes the resupply venture will lead to transporting astronauts to the space station in the Dragon capsule in just a couple years. If thrusters stalled like this on a manned mission, Musk said, the outcome wouldn't necessarily be grim. The capsule is designed to return to Earth with just two good sets of thrusters and, in "a super worst case situation," conceivably just one although it would be "a bit of a wobbly trip." The space station was orbiting 250 miles above the Atlantic, just off the New England coast, when the Falcon soared. Astronauts will use a hefty robot arm to draw the Dragon in and dock it to the station. Also on board with the fruit: 640 seeds of a flowering weed used for research, mouse stems cells, protein crystals, astronaut meals and clothing, trash bags, air-purifying devices, computer parts and other gear. NASA's deputy administrator, Lori Garver, said using commercial providers is more efficient for the space agency. It's part of a long-term program, she noted, that has NASA spending less money on low-Earth orbit and investing more in deep-space missions. That's one reason why the space shuttles were retired in 2011 after the station was completed. The goal is to have SpaceX, or Space Exploration Technologies Corp., and other private firms take over the job of ferrying astronauts to and from the space station. Russia does that now—for a steep price. 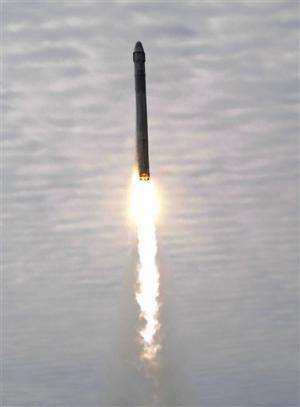 Competitor Orbital Sciences Corp. has yet to get off its Virginia launch pad. The company plans to launch a free-flying test of its Antares rocket and Cygnus supply ship in April, followed by a demo run to the space station in early summer. Russia, Japan and Europe regularly make station deliveries as well. But only the Dragon is designed to bring back substantial amounts of research and used goods. The other supply ships burn up upon re-entry. The newest Dragon is scheduled to spend more than three weeks at the space station before being cut loose by the crew. It will parachute into the Pacific with more than a ton of medical samples, plant and cell specimens, Japanese fish and old machinery, and used spacewalking gloves and other items. SpaceX plans to launch its next Dragon to the station in late fall. 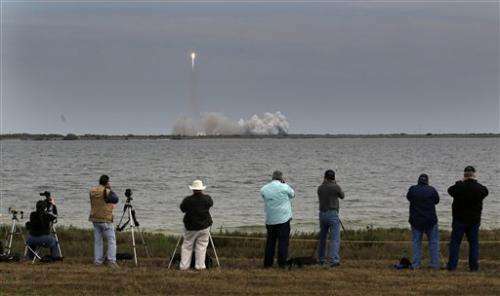 More than 2,000 guests jammed the Cape Canaveral launch site Friday morning to watch the Falcon take flight. It wasn't much of a show because of all the clouds. The successful separation of the Dragon from the rocket was broadcast live on NASA TV; on-board cameras provided the unique views nine minutes into the flight. Then the trouble struck, and the coverage ended. "It's looking like we're going to be back on track here," Musk later assured everyone. If they manage to reach the ISS despite this incident, it will be a nice proof of the robustness of their launching and orbiting system. Why are they letting the apples spoil? Cant they design a line with a magnet on the end to reel her in if they don't trust the rocketry?